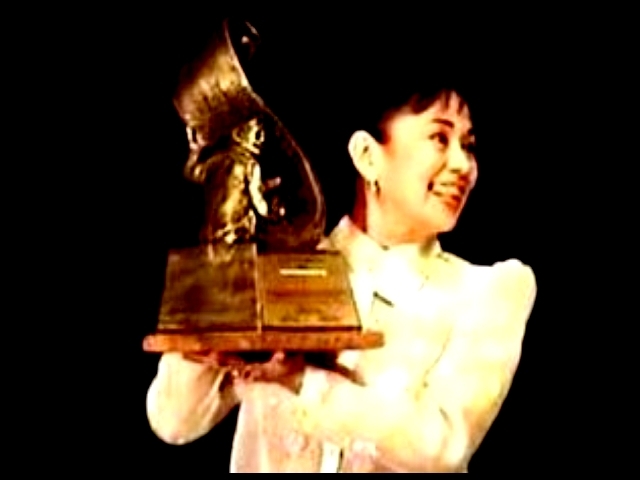 When Vilma Santos or Ate Vi, to most of us, was handed the trophy as the 2005 UP Gawad Plaridel awardee, she exclaimed “Wow! Ang Bigat!” I’m sure she meant it literally but it can also mean figuratively. The trophy designed and made by National Artist for Sculpture, Napoleon Abueva, was made of bronze and was really heavy. This is the third Abueva designed trophy that ate Vi has received. She earlier received Abueva made trophies from the CineManila International Film Festival as Best Actress and as Lifetime Achievement awardee. The trophy may be heavy but the prestige that goes with it is heavier! As what the citation says, Gawad Plaridel is the sole award in the University of the Philippines (UP) system given to outstanding media practioners. For this year, the recipient is from film, next year will be from radio, next is television, then new media, print and after 5 years back to film again. Ate Vi is the very first awardee in film and it will take 5 long years before this feat will be duplicated. The awards rite is scheduled to start at 2pm, and we, my mother and a cousin, whom I asked to take video of the event, arrived just a few minutes before 2. We were welcomed by no less than the Dean of UP-CMC, Dr. Nick Tiongson, ( I must admit, I’m impressed with his memory, dahil natandaan niya ako kahit minsan pa lang kami nag-meet ng ihatid naming ni Jojo (Lim) ang mga materials for lobby display and for the souvenir program), sabi ni Dean, “O, kumusta ka na?” Sagot ko naman, “Heto ho, nanlalamig sa nerbiyos.” Talagang ninenerbiyos ako dahil alam kong hindi lang ito isang ordinaryong award para kay ate Vi. To some extent, kasing ka-prestigious na ito ng National Artist Award. Imagine, ang mga bumoto para sa gawad na ito ay mga professor ng UP na halos lahat ay may PhD! Sumunod na sumalubong ang mga kasamahang vilmanians na sina Jojo, Cesar at Noel, binibiro nga nila ako na nagpa-star for all seasons daw ako. Sabi ko “Bakit andyan na ba si ate Vi?” Chorus nila “Andyan na! 10 minutes ago!” Sa loob-loob ko naman, ganito pala ang feeling ng mag-grand entrance! Cesar lead us to our assigned seat. Malapit lang kami sa stage which is good para makalapit agad kami ng Mama ko kay Vi after the awards rite. I didn’t know na may naka-assign pala akong seat na mas malapit sa stage, sa tabi nina Jojo at Paolo. This is reserved for those who in one way or the other, have helped in the mini exhibit and the materials used in the souvenir program. Anyways, after my mom was settled sa upuan niya, I went outside of the theatre to buy the souvenir program. The souvenir program is a collector’s item para sa mga Vilmanians at para sa mga Vilma followers. It was very tastefully done, gold ang kulay ng cover at nakasulat lang ang “UP Gawad Plaridel 2005 – College of Mass Communication. Naka-emboss sa cover ang logo ng UP. While reading the messages sa souvenir program, I can’t help but feel very proud of being a vilmanian. Very glowing ang mga messages nila! On my way back to the theatre, naka sabay ko na sina ate Vi escorted by Sen. Ralph. I greeted both of them, na in-acknowledge naman nila, with ate Vi’s very warm smile on her lips. I went inside before them dahil they will march going into the theatre. The processional will start at the back of the theatre going to the stage. First in the processional, were the professors of the College of MassCom, followed by Dean Tiongson, then UP Chancellor Mr. Sergio Cao and UP President Ms. Emerlinda Roman. Next is last year’s awardee Ms. Eugenia Apostol, then this year’s awardee Ms. Ate Vi, no less escorted by her husband, Sen. Ralph Recto. The program was emceed by Prop. Jane Vinculado, director, Office of Extension and External Affairs. After the National Anthem was sung, nagbigay ng opening remarks si Dr. Tiongson, after which ay naghatid naman ng kanyang mensahe si Dr. Sergio S. Cao, PhD. In his speech, he said that “This is the first time that I saw Ms. Santos in person and I’m starstruck! You are so beautiful!” He even kidded that he had to go to the infirmary to use the nebulizer, dahil nagsikip ang dibdib niya after makita niya si ate Vi! While listening to his speech, I was teary-eyed. Dahil mga salita ito na nagmumula sa isang hindi ordinaryong tao! He said that he was awed by what ate Vi has accomplished both as an actress and as a mayor. He also said that he has not watched many of ate Vi’s films, in fact, he hadn’t seen much Filipino movies, but of the few that he saw, he likes ate Vi’s acting very much, and he specially mentioned “Ikaw ay Akin”, where he said that ate Vi was marvelous! After his speech, ng pabalik na siya sa upuan niya tumayo si ate Vi to greet and thank him, and he planted a kiss on ate Vi’s cheek to the delight of the crowd who cheered him on. The audience was composed of students from UP, Ateneo, Mirriam College, La Salle-Lipa, PUP, UE and Trinity College, of course hindi mawawala ang mga over loyal, over true Vilmanians. The theatre’s capacity is 800 at punong-puno ang theatre, marami pa ang mga nakatayo sa magkabilang aisle. Sabi nga ng isang staff ng UP, had they known na ganito karami ang attendees, sana ang UP Theatre na lang ang ginamit, which is much bigger. Among the celebrities spotted were Tirso Cruz III and wife Lyn, Charo Santos-Concio, Ricky Lee, Chito Rono, Atty. Laxa, Jerry Sineneng, Laurice Guillen and Chit Guerrero among others. The press was also there led by Ricky Lo, Mario Dumaual, Lhar Santiago, Morly Alinio and Ambet Nabus. Next in the program, was a song number by Ms. Katrina Saporsantos, a soprano who sang “Ipagpatawad Mo”, next is Dean Ramon Acoymo, a tenor who sang the most moving version of “Sana Maulit Muli”. They then, sang together a medley of “Bato sa Buhangin”, “Tubig at Langis” and “Sinasamba Kita” all theme songs from Vilma’s movies. They were accompanied in the piano by Mr. Jeremiah Calisang. Next is the documentary entitled “Vilma sa Putting Tabing: Ikaw, Siya, Tayo” . Medyo misty eyed na naman ako dito sa portion na ito dahil sa mga testimonials nina Atty. Laxa, Christopher de Leon, Marra Lanot and others. Meron din portion na in-interview ang kasama nating vilmanians like Jojo Lim, Remy, Cora and Zeny aka Pitimini (ni Kuya Ike Lozada). I wish I can ask for a copy of this docu, sana rin malinaw ang register sa video na nakuhanan namin. After this documentary, ay iginawad na kay ate Vi ang parangal nina Drs. Roman, Cao and Tiongson. After which ay nagbigay na si ate Vi ng kanyang lecture/speech. She started her speech by saying na kinakabahan siya. Sabi niya sa presentation na ginawa nila para sa kanya, overwhelmed siya talaga! Para daw siyang presidente! She acknowledge all who attended the event, and started to look back on her 42 glorious years in the business. She enumerated some of her landmark films and some notes that go with them, like when Burlesk Queen was offered, she said “Diyos ko, paano ako magsasayaw ng burlesk eh nag-aaral ako sa mga madre!” She was a product of the RVM Sisters which ran the St. Mary’s Academy where she studied from kinder to high school. She also recalled that after winning her very first grandslam for Relasyon, she was scheduled to shoot for another Bernal film, Broken Marriage. Sa isang eksena nila ni Boyet de Leon, naka take 7 siya! Sabi raw ni Bernal, “Ano ka ba, Vi, dapat malungkot ka dito sa eksena eh bakit may stars ang mga mata mo?” Paalala sa kanya ni Bernal, “Hindi por que naka-grandslam ka na ay ikaw na ang pinakamahusay”. Pinapasok daw siya ni Bernal sa comfort room at pinag-jogging siya for 10 minutes, bago kuhanan muli ang eksena which turned out to be perfect. At ito raw ang hanggang sa ngayon ay naging guide niya, kaya hanggang sa ngayon ay patuloy pa rin siyang nag-aaral sa kanyang propesyon. Sabi niya ang pag-arte ay walang katapusang pag-aaral. Kahit daw sa panonood ng news sa TV, iba iba ang pag-iyak ng mga tao, at pinag-aaralan niya ito para hindi rin pare-pareho ang kanyang style ng pag-iyak. She also recalled how she went to Mother Lily after hearing reports that her Sister Stella L was not as well accepted as Sharon’s Bukas Luluhod ang mga Tala, on which mother Lily anwered “ganyan talaga ang buhay”. She also said that malayong-malayo ang estado ng pelikula noong nagsisimula pa lamang siya at sa ngayon. She said that we used to produced more than 200 movies a year pero last year it was down to just a little more than 50. Sinabi niya na marami sa mga kasamahan niya sa industriya ang walang trabaho. Ang iba nga raw ay nagpupunta pa sa kanya sa Lipa upang humingi ng tulong. Sinabi niya na dapat daw ay mas bigyan ng priority ang ating mga pelikula kaysa sa dayuhang pelikula. She cited Spiderman 2 na nasabay sa isang local movie, syempre panalo ang Spiderman 2 with more than P20M gross sa first day nito sa Metro Manila alone, samantalang ang nakasabay na pelikulang pilipino ay nagpasalamat na sa P5M first day gross nito. Sana raw ay huwag naman sabayan ang playdate ng mga pelikulang pilipino ng malalaking pelikulang dayuhan, after all wala namang pinapalabas na pelikulang tagalog every week. Isa pang problema ng pelikulang pilipino ay over-taxation, mahigit daw 50% ng gross ng pelikulang pilipino ay napupunta sa tax. Umugong ang malakas na palakpakan at karamihan pa ay hindi napigilan ang pagtayo bilang pagbibigay pugay sa isang aktres na naiiba, nag-iisa at patuloy na ginagamit ang kanyang talino para sa kapakanan ng mas nakararami. And mind you, hindi lang mga Vilmanians ang nag-standing ovation! Tunay ka! Iba ang isang Vilma Santos! Who and How they Voted? – The Second U.P. Gawad Plaridel (2005, Film)For 2005, the award is given to an outstanding film practitioner.The U.P. CMC received nine nominations from various media organizations and academic institutions on April 8, 2005, the deadline for nominations. The nine nominees were Nora Aunor, Celso Ad. Castillo, Ricky Lee, Mike de Leon, Lily Monteverde, Eddie Romero and Vilma Santos. The first round of deliberations was held on April 19, 2005. The screening committee was composed of the following: Dr. Nicanor G. Tiongson (Dean, U.P. CMC), Dr. Rolando B. Tolentino (Acting Director and Professor, U.P. Film Institute), Dr. Grace J. Alfonso (Professor, U.P. Film Institute), Ms. Eliza Cornejo (Instructor, U.P. Film Institute), Prof. Anne Marie G. de Guzman (Assistant Professor, U.P. Film Institute), Prof. Roehl J. Jamon (Assistant Professor, U.P. Film Institute), Prof. Eduardo J. Lejano (Assistant Professor, U.P. Film Institute), Prof. Eduardo J. Piano (Assistant Professor, U.P. Film Institute), Prof. Arminda V. Santiago (Assistant Professor, U.P. Film Institute). This committee recommended three nominees, Mike de Leon, Eddie Romero and Vilma Santos as finalists for the awards. The second screening with the representatives of the three departments of the U.P. CMC took place on May 11, 2005. The body, known as the U.P. CMC Gawad Plaridel Faculty Committee, was composed of the following: Dr. Nicanor G. Tiongson (Dean, U.P. CMC and Chair, CMC Faculty Committee), Dr. Lourdes M. Portus (College Secretary, U.P. CMC), Dr. Rolando B. Tolentino (Acting Director and Professor, U.P. Film Institute), Prof. Eduardo J. Lejano (Assistant Professor, U.P. Film Institute), Prof. Victor C. Avecilla (OIC, Dept. of Broadcast Communication), Mr. Fernando A. Austria (Instructor, Dept. of Broadcast Communication), Prof. Ma. Cristina I. Rara (Assistant Professor and Chair, Dept. of Journalism), Prof. Luis V. Teodoro, Jr. (Professor, Dept, of Journalism), Dr. Aleli A. Quirante (Associate Professor, Dept. of Communication Research), Ms. Alexandra More M. San Joaquin (Instructor, Dept. of Communication Research) and Prof. Elizabeth L. Enriquez (Assistant Professor, Dept. of Graduate Studies). After deliberating on the credentials of the three finalists, the committee chose Ms. Rosa Vilma Santos as the recipient of the U.P. Gawad Plaridel for 2005. She is scheduled to received the U.P. Gawad Plaridel trophy and deliver the Second Plaridel Lecture on July 4, 2005 at the Cine Adarna of the U.P. Film Institute. Message from the Dean of UP-CMC – Traditionally, academia has always kept a discreet distance from show business, and for good reason. For one, academics have always emphasized critical thinking and professional integrity, both of which seem to be rare commodities in a movie world obsessed with instant gold and glamour. For another, the popularity of a movie star, to be sure an unwanted legacy from Hollywood, has been used by producers to cover up for a multitude of their cinematic sins, such as the lack of intelligent scripts, competent directors, and solid production values.But stardom is not a sin in itself. In the hands of film actors who are sincerely committed to their art, popularity can be harnessed to uplift the artistic standards of the whole film industry. In fact, it can contribute significantly and directly to the development of a Filipino national cinema, if the movie star, with cunning and imagination, can use his or her popularity as a way of pressuring filmmakers to create screen characters and stories that reflect and interpret urgent issues and concerns in contemporary Philippine society.In choosing Vilma Santos as the U.P. Gawad Plaridel Awardee for film, the College of Mass Communication would like to offer to the film and media industries incontrovertible and living proof that popularity – and ratings – need not lead to the degradation of media tastes and standards. In fact, they can inspire media practitioners to compete with each other to be the best that they can be and encourage filmmakers to create films that liberate and transform the many levels of consciousness of the Filipino people. – Nicanor G. Tiongson, Dean, College of Mass Communication. Message from UP Chancellor – Every year the U.P. Gawad Plaridel honors the media person whose work successfully merges the artist and the public servant, and constantly raises standards of artistry by being true to the craft while at the same time challenging the conventional notions of art as being merely “for art’s sake.” This year’s awardee, Ms. Vilma Santos, is one such media person. She has earned recognition here and abroad for her fine and powerful performances as wife, mother, lover, NGO worker, and OFW in films that are now considered modern classics. In the process, she has also redefined womanhood, questioned traditional gender roles, and clarified the relationship of an individual to her society.More importantly perhaps, Ms. Santos has used her status as a celebrity to pursue public service. As Mayor of Lipa City, she has proven that art and politics do not exist in separate planes. She has shown us that women artists can transform society in more ways than one.Congratulations, Ms. Vilma Santos. – Sergio S. Cao, Chancellor, U.P. Diliman. Gawad Plaridel Citation – Gawad Plaridel CitationFor crafting and creating her varied cinematic roles with consummate artistry, making us empathize with whatever character she is portraying by delineating for us the character’s history, problems, and aspirations, in dynamic interaction with the film’s ensemble of other characters;For bravely using her popularity as an actor to choose roles which brings to the public attention an astounding range of female experiences as well as an array of problems confronting women of different classes and sectors in contemporary Filipino society, even if these experiences or problems would not only not enhance but could even detract from her mass appeal;For bringing to life on screen characters whose stories have the effect of raising or transforming the consciousness of women, leading them a few steps closer to a deeper understanding of their situation vis-à-vis the patriarchy and to the ability to control their own lives and make choices of their own;For courageously playing maverick characters which dared to speak the truth in a period of intense political repression and reprisal, thereby showing a concern not for her own self but for a Filipino society fighting for basic human rights under a dictatorial regime;For building a brilliant career which saw her grow from popular icon to professional actor through self-discipline and tireless honing of her craft, thereby challenging writers, directors, and producers to come up with films that would be worthy of her enormous artistic resources and repaying their efforts with some of the most unforgettable performances in Filipino cinema;For showing that the movie star can place the stamp of her own individuality and talent on the films she choose to make, thereby proving that the star can be regarded as an auteur in her own right;For excellence, integrity, and social responsibility which have distinguished her major performances, and for being a model of professionalism to other actors and technicians engaged in the creation of a Filipino national cinema;The U.P. 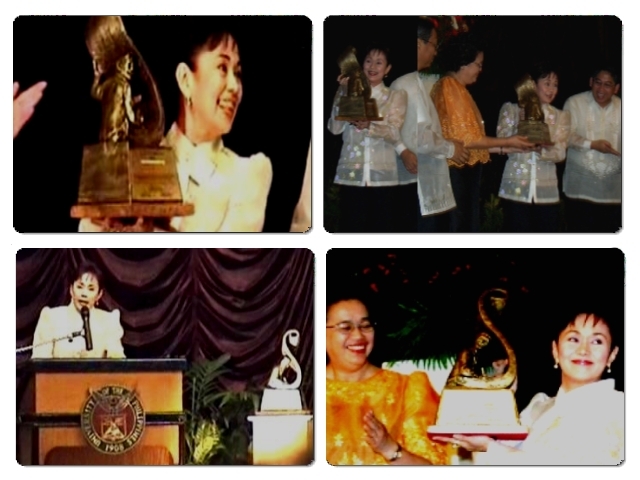 Gawad Plaridel 2005 is given to Rosa Vilma Santos on the 4th day of July 2005 by the U.P. College of Mass Communication at the Cine Adarna, U.P. Film Institute, University of the Philippines, Diliman, Quezon City. – Signed by: Emerlinda R. Roman, Ph.D.President, University of the Philippines; Sergio S. Cao, Ph.D.Chancellor, U.P. Diliman; Nicanor G. Tiongson, Ph.D.Dean, U.P. College of Mass Communication. Vilma Santos sa Puting Tabing: Ikaw, Siya, Tayo – My Film 100 professor had said that when you see Vilma Santos in person, it’s really hard not to get starstruck with her stellar appeal. UP Diliman Chancellor Francis Sergio Cao agrees. In his opening remarks at the Gawad Plaridel 2005 Awarding and Lecture, he confessed it was still his first time to see the famed actress in person and just how “starstruck” he was to be near her (two seats away); yeah, I could almost hear him jittering. Well, good for them; they got to be a meter or two away from this still youthful even in her golden age film icon. Me, the closest that I could get was just around 8-10 meters. I was in awe, of course, to have seen one of my favorite older actresses. But not much awe for me to be considered starstruck. I was just way beyond the “Starstruck Radius”. But aside from Vilma Santos, many prominent people were also present in the occasion. Here’s a list of those I can remember: Sen. Ralph Recto, UP President Emerlinda Roman, National Artist Napoleon Abueva (who sculpted the Gawad Plaridel trophy), ABS-CBN boss Charo Santos-Concio, Eugenia Apostol (Philippine Daily Inquirer founding chairperson and last year’s Gawad Plaridel awardee) and Film director Chito Roño. Members of the media were also there. I even got to see Mario Dumaual, that showbiz reporter in ABS-CBN! It was him whom I got to see closest; he and his crew were shooting a mere meter in front of me. That portion where he is talking, with the stage and the lecturing Ate Vi in the background–I was right at the back of the cameraman. Vilma Santos’ mother was also there. There sure were many film producers and directors present in the affair, it’s just that I forgot their names or they were not acknowledged at all. Students and faculty members from different universities and colleges occupied most of the theater’s seats. And yes, magpapahuli ba ang mga die-hard Vilmanians? They occupied the middle seats; you’ll know its them with their distinctive gray hair. PS. I don’t have a camera to prove that what I say is true (but trust me, it really is true). Thankfully, in less than two months, I’m having my first digital camera! My aunt in Ohio is sending me one (bless her) after a month of grueling “courtship.” So you might as well expect a photoblog from me in August. On The Prowl Article: How I wish there were more intelligent and passionate individuals like her in local show biz. My long overdue visit to my beloved alma mater, UP’s College of Mass Communication and our tambayan, the Broadcasting Association, was a dejavu of sorts for me, and an overall enjoyable afternoon. Besides seeing the newer breed of young “broad-assers” as we call them (pardon the term of endearment), as well as my close professor-associates, I also witnessed the awarding of the Gawad Plaridel to the country’s premiere actress, Lipa Mayor Vilma Santos, which my friend Rome Jorge talks about in today’s banner story. Instead, let me fill you in on the glittering list of Ate Vi’s well-wishers that day—from her industry colleagues to the academic multitude to her loyal Vilmanians—who all gave the gem of an artist a standing ovation at the end of her 45-minute speech. This entry was posted in ACHIEVEMENTS, ARTICLES and tagged FAMAS, Nora Aunor, philippine movies, recto. Bookmark the permalink.